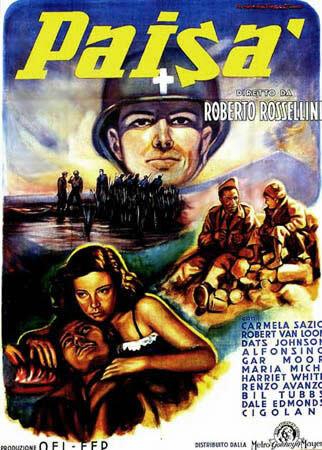 Roberto Rossellini's other classical film on the Resistance is PAISA (1947). Here echoes from the cinema of the past fuse with certain important premises for the development of the cinema of the future. The film is divided into episodes, that is a kind of film rarely exploited in Italy (only two titles come to mind: QUARTA PAGINA [FOURTH PAGE] by Nicola Manzari in 1943 and CIRCO EQUESTRE ZA-BUM [ZA-BUM CIRCUS] by Mario Mattoli in 1944) and ventured with some success only by Hollywood (IF I HAD A MILLION, 1932) and the French (CARNET DU BAL, DERRIERE LA FACADE, PARADE EN SEPT NUITS). Episode films were frequently nothing more than a random collection of short stories. Rossellini, instead, linked each episode to the others: the film as a whole, paints the historical picture of the Allied advance in Italy from the landing in Sicily in June, 1943, to the liberation of the North in 1945. The first and last of the short episodes are starkly tragic, fraught with death. In between, however, the director and his associates alternate humor and drama. See, for example, the two completely comic episodes about Naples (the friendship between a black American soldier and a Neapolitan "sciuscia" of bootblack) and the Romagna (the quandry of a convent of Catholic friars forced to take in two American chaplains of a different religion). Also in PAISA, written mostly, like ROMA, CITTA APERTA [ROME, OPEN CITY], by Sergio Amidei, the humorous touch of Fellini can be detected.